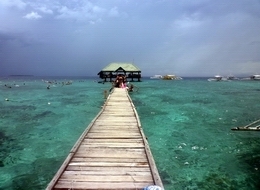 Cebu Island Hopping Island Nalsuan Island 1 Island Package Tour. 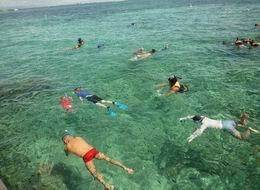 Tour Narusuan Island is favored snorkeling, but most of the same fishes are clustered near the pier, but snorkels away from the pier are better. The ecology of the natural state can be observed. 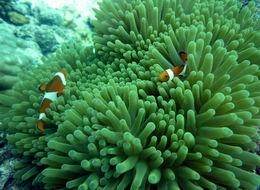 Nalusuan island is 40 minutes away from our shop in Maribago with beautiful corals, tropical fish and with the chance of visibility of stingrays and turtles. 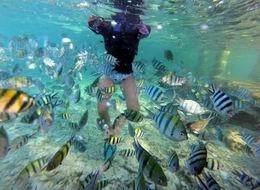 It's the best site for diving and snorkeling. Even around the jetty you can see schools of fish. You can stroll inside the island and swim on the other side of it with white sand which you enjoy most during low tide. Bringing food and drinks inside the island is not allowed. BBQ lunch is cook and serve on board with pick up time from 8am – 10am in any Mactan hotels and from Cebu or Mandaue hotels, take taxi with departure time in your hotel from 7:30am – 9am with P300 refundable as part of your round trip transportation expense. The trip is up to 6 hrs provided that you will be back in our shop before 4:30pm. Inclusions: Exclusive boat-Special BBQ Lunch – Pickup Services-Drinks-Snorkel Sets-Sanctuary Fee(300)-Bread (fish feeding)-Towels-Tax- Cottage Fee. (3n Nal) No Lunch - 4 hours trip, morning or afternoon session only.